Intellectual curiosity leads one to speculate about patterns in observed data. I’ve done this in the case of birth certificate numbers in Hawaii. From what we know, birth certificates were numbered centrally at the State Health Bureau office in Honolulu using a stamping machine. The question is whether or not there is any rhyme or reason in the order in which the certificates were stamped. In a previous article, Obama’s birth certificate number, I explored what I knew and proposed a plausible scenario to explain it, suggesting that records might have been alphabetized in multi-week (perhaps monthly) batches before stamping, something that makes sense from the standpoint of filing efficiency. Then a new data point arrived, courtesy of a poorly-redacted birth certificate image published at WorldNetDaily. That certificate blew away birther theories of a strict birth-order sequence in the serial numbers. 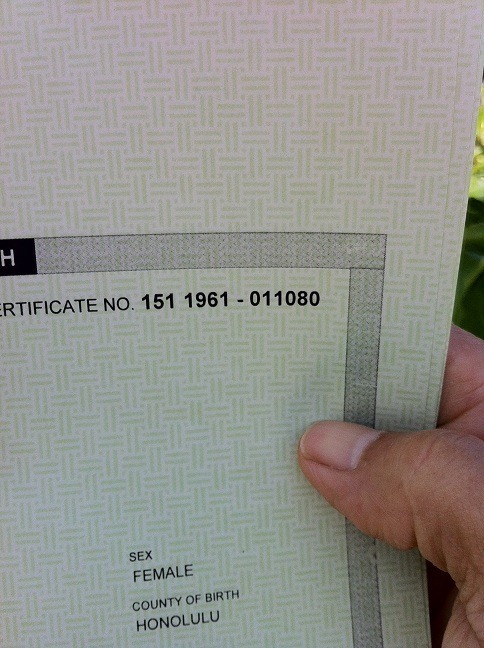 I wrote about that certificate in New Hawaiian certificate explodes birther theories. Now, courtesy of Dean Haskins, there’s a new data point. This certificate is represented as for a child named Sunahara who was born the same day as Barack Obama and died one day later. The first observation, in response to the question: “did Obama steal baby Virginia Sunahara’s Birth Certificate?” is that we can categorically say “no” because the certificate number doesn’t match. So how does this new number fit in? Besides reasonably fitting what one would expect for an August, 1961, birth, it’s not very helpful. It’s consistent with a batch alphabetization scheme only if they are first gathered by birthing facility. Since Sunahara was deceased by the time the certificate was filed, it might have been handled differently for another reason or more likely it was because she was born in a different geographical area. The range of numbers we see now spans 1136 births. An average month in Hawaii in 1961 had 1468 births. There’s a lot of data we just don’t have. So Haskin’s proves Virginia Sunahara was born at a different hospital in a different city and a different BC number than Obama. And icing on the cake, the BC number is hand written on the death certificate. What a great finding, biferstanies are excited. This all proves that Virginia was definitely born on 8/4/1961 and died on 8/5/1962. push that pay pal. The people that financed Haskin’s trip expected it to have the same number as Obama, do you think they are upset with Haskins and want their money back? On my blog I am still calling the Sunahara birth certificate number unverfied since neither a name nor date is shown on the photo. She apparently was born at a different hospital than the others who were all born at Kapi’olani. If correct, it also is additional proof there is nothing at all out of place with the Obama and Nordyke certificate numbers. Yeah, that pretty much sums it all up. No surprises or anything unexpected here at all. The certificate in question does not suggest that all births within the same time period were all numbered strictly alphabetically. However, it does (along with other known certificates) help to establish that certificates were not numbered in strict order of birth. As many people (especially Dr C) have pointed out, processing registrations in strict order of birth would require controls and procedures that would involve expenditure of additional resources. As I have pointed out before, such controls are in place for processing of land registration applications because the order of registration of different interests can have a substantial impact on legal rights; in birth registration, no person has greater rights than another solely by virtue of the fact that his birth certificate was processed first. As the numbering of Obama’s certificate relative to the Nordykes’ certificate has been established to have no real meaning in terms of the order of the births, the birthers’ claim of any relevance of the certificate number has been quite thoroughly debunked. Thus, the exact mechanics of certificate numbering are no longer relevant. Another data point: The name on the death certificate was altered. Was the birth certificate altered as well? Is there a picture of the complete BC for Sunahara. I believe HRS 338 requires alterations to be noted on the certificate. richCares: So Haskin’s proves Virginia Sunahara was born at a different hospital in a different city and a different BC number than Obama. Although she was transfered to Kapiolani where she died. The Navy supply system uses pre-numbered parts requisition forms. Packs of forms are checked out to every installation/division/ship. Isn’t it possible that blocks of pre-numbered forms are issued to each hospital? This would account for the wide range of numbers. When I needed more forms, I would just pick up a stack at the supply office. I might pickup 2000 at a time, so that I always had some on hand. If the clerks at the hospital did the same thing, it would easily explain out of sequence numbers at the same hospital. The number could correspond to the ship (as they would to the hospital), but it didn’t do much to establish a date. We simply need a larger data set, or the cooperation of the Hawaii DOH, before we can arrive at a reasonable conclusion. so he is still locked into ID theft but ignores Obama’s BC is not the same as dead Virginia, wonder why? he may believe the long form has a dufferent number. richCares: so he is still locked into ID theft but ignores Obama’s BC is not the same as dead Virginia, wonder why? he may believe the long form has a dufferent number. But it gives us something to report on and smile at. either Haskins is a con man getting bucks from the gullible or he is really stupid, I think con man is correct answer. How long can this scam continue? I suggested this a long time ago. Doc superior research found that Hawai’i says they do not, and did not in 1961, use preprinted numbering. The process is fairly well documented, the number was assigned as one of the last steps in the manual processing that took place in 1961. What has not been documented, but only inferred, is that the births were numbered in alphabetized batches, probably on a monthly basis. Keith: I suggested this a long time ago. Doc superior research found that Hawai’i says they do not, and did not in 1961, use preprinted numbering. The process is fairly well documented, the number was assigned as one of the last steps in the manual processing that took place in 1961. What has not been documented, but only inferred, is that the births were numbered in alphabetized batches, probably on a monthly basis. Of course the most logical thing (in an era before every office had computers with easy access to databases) would be that the ordering was logical in some way to make it easier to look up a particular name alphabetically once placed in a bound volume. 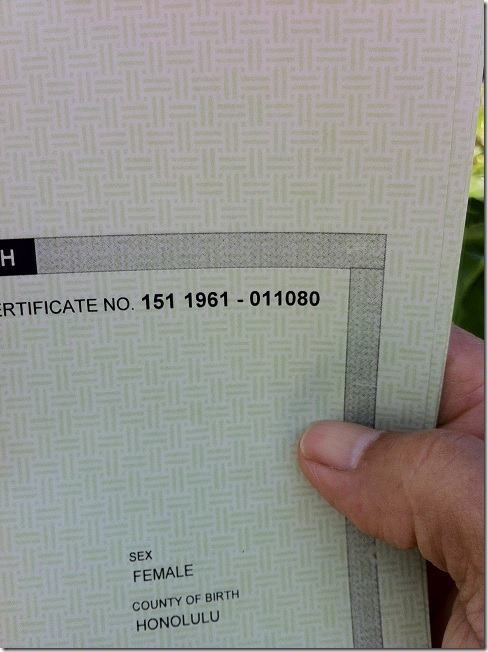 Of course it would be helpful to know the day that a birth certificate was filed at the office. Birth order can’t possibly be how they number it. The time it takes to file the original certificate varies. The State Dept will accept one filed as late as just under one year after the DOB as primary proof of citizenship. I could easily imagine a birth certificate that’s filed a couple of months after birth because a doctor goes on vacation just after delivering a baby. richCares: he may believe the long form has a dufferent number. There is that but Haskins also believes that when it gets his hands on Virginia’s LFBC, it will look nothing like the President’s (format, security paper, type face). Over ORYR, William Lolli commented that he believed there was a “significant” probablity that President Obama was using Virginia’s number. And that’s after it was known their numbers didn’t match. There is much delusion in the higher echelons of the birthers. If you go to the post office and get something like a certified/registered mail form or delivery confirmation form, it’s a preassigned unique number on each form. There are literally thousands of post offices, and I doubt there’s any rhyme or reason to which batches get sent to which post offices. I’ve grabbed a few forms at one post office and used them at another. However, I’m thinking that they wouldn’t do that for birth certificates. They’re trying to get some sort of semblance of order when filing, and I doubt that lots of gaps in the numbers are terribly conducive for any kind of well ordered filing system. In addition to that, examples of photocopy or photostat versions of Hawaii’s long form don’t look like the certificate numbers are machine stamped, but rather show the hallmarks of one of those dialed in wheel number stamps that are used for hand stamping. The numbers aren’t very well aligned, which is what I remember was typical from that type of stamp. richCares: either Haskins is a con man getting bucks from the gullible or he is really stupid, I think con man is correct answer. think he’s trying to live up to the success and admiration that his brother earned that he never achieved. Dragging his once respected family name through the mud seems like an odd way to go about it. ORYR is giddy with Haskins and the Sunahara suit, proof that Obama used the dead girls BC is zero yet the ORYR gang believes Haskins did it. Haskins has not addressed the fact that the Sunahara cert is a different number, only that using a dead infant’s BC is crux of his make believe. Except for ORYR, this story is dead and gone. It is amazing what hate causes people to believe. When the long form is shown to be the same BC number as the COLB then Haskins financier cries for his money back. For amusement purposes only read how Dean Haskins built up to this ginormous news with no fewer than six articles at the Birther Summit site starting on November 6th. I think he may have just set the bar for anticlimactic, over-hyped, tripe. Reality Check: I think he may have just set the bar for anticlimactic, over-hyped, tripe. Yep, that recent post about his new Sunahara fetish was his first in nearly a month. BUT! At least he finally found a friend. All those photos of him, alone, with his cute little birthersummit banner were pretty depressing. The Hawaii Dept. of Health has stated that the forms were numbered in the central office, and this is how it is done in other states where I have worked. RPPO: Isn’t it possible that blocks of pre-numbered forms are issued to each hospital? He may get his hands on a copy of her long form certificate, but he will likely not get a certified copy of it and that means it will not be on security paper. gorefan: There is that but Haskins also believes that when it gets his hands on Virginia’s LFBC, it will look nothing like the President’s (format, security paper, type face). the COLB has the BC number so why the urgent need for a long form that will only confirm the COLB, yet people at ORYR fall so easily for this scam that they are buying frogs in anticipation of the frog marching. Isn’t scamming to the mentally ill a crime? Holy heck! I think I may have known or at least met Haskins when we were kids! I was born in Pontiac Michigan too, but my family lived in Birmingham. I can’t be certain that the kid I am thinking of was him or his family, but it does sorta fit the memory. I was probably 4 or 5 at the time, when I was playing around with the kid from next door. My dad had bought a 20 acre farm on the edge of the expanding urban development on 13 Mile Road and bit by bit sold off 18 acres for a sand pit and other development. We lived in the original farm house on the remaining 2 acres, and this kid lived in one of the first houses to be built. The kid was probably 18 months or 2 years old at the most I suppose. As kids do he eventually started throwing rocks at me and one hit me. I retaliated in kind, as kids do, and he started screaming. His mother came running out and started yelling at me, my mother responded to the kerfuffle and started yelling back at her. I had never seen my mother so angry and loud, and I don’t think I ever did again. The only words that ever stuck with me was my Mother telling me as she dragged me away, that ‘people who live in glass houses shouldn’t throw stones’. I just wanted to see their glass house and find out how they kept it from breaking and cutting them every time they bumped into a door. Anyway, we moved to Arizona when I was 6, so I didn’t have much contact with them after that. I think they were paying Dad directly for the land, that is he was ‘carrying the loan’ himself (I know they did that when they sold my Grandmother’s house). Whenever this family was discussed they were always called ‘the religious nuts’ (we were Presbyterians in Michigan and went to a Methodist Church in Arizona). Just to be clear, I mean Terry Haskins, not Dean. Keith: Holy heck! I think I may have known or at least met Haskins when we were kids! I was born in Pontiac Michigan too, but my family lived in Birmingham. The only words that ever stuck with me was my Mother telling me as she dragged me away, that people who live in glass houses shouldn’t throw stones’. I just wanted to see their glass house and find out how they kept it from breaking and cutting them every time they bumped into a door. Anyway, we moved to Arizona when I was 6, so I didn’t have much contact with them after that. I think they were paying Dad directly for the land, that is he was carrying the loan’ himself (I know they did that when they sold my Grandmother’s house). Whenever this family was discussed they were always called the religious nuts’ (we were Presbyterians in Michigan and went to a Methodist Church in Arizona). Perhaps starting fights and then running away became one of their treasured family traditions. richCares: When the long form is shown to be the same BC number as the COLB then Haskins financier cries for his money back. Do you really expect birthers to accept reality? 1. “The Sunahara BC’s are forged as well”, likely leading to an endless chain of “Whose BC number did they use for the forged Sunahara BC? And whose BC number did they use for the forged BC of the person they used for the forged Sunahara BC?” etc. Obama was not born in a hospital in Hawaii. This would explain the out of sequence number of obama’s birth certificate. His birth could have been registered some time after his birth date. Was he born at home in Hawaii or was he born outside of the US and rushed to Hawaii to be registered? “Officially, births can be registered in the state of Hawaii regardless if they actually occurred there when a doctor is able verify and sign an administratively originated “Certificate of Live Birth” from the Department of Health. The doctor does not have to be the actual birthing doctor. Because of its historic indigenous population, “walk-in” registrations and permeable migratory culture, when a doctor examined the child in the 1960s and affirmed parentage and identity, that doctor became the attending physician of record in Hawaii, regardless if he or she was actually the birthing doctor. According to HRS 338 and 571, the term “attending physician” does not only mean one who attends the birth in Hawaii, it also applies to one with medical qualifications who examines and attests to the health of the child after birth. According the Hawaii Revised Statute 338, the Department of Health was obligated to provide this very document to any applicant upon receiving evidence from the applicant that proved the birth parents to be residence of the state of Hawaii. HRS 338 also contains legal mandates which force the Director of Health in the state to issue “original birth certificates” to applicants under similar circumstances when the “adult or minor” applicant states that they do not have an original birth record from any other agency…regardless of the location of the birth. Simply on its face, even if the document were assumed to be an authentic representation of Obama’s original, 1961 “Certificate of Live Birth”, the information contained within it was transcribed to the document image by the Department of Health, not the hospital named within it. 7tgljgf69o7rl: Obama was not born in a hospital in Hawaii. Except his birth certificate attests that he was. Except the cerficate would state the actual place of birth and hospital of birth. Can’t you even make the minimal effort required to use the updated birther talking points? What is wrong with our recent trolls? Ah for the trolls of last year…. And he really could have been born on Mars and is our first non-human President! Wild speculation about how the official documentation could possibly be wrong is just that- wild speculation. Perhaps our new troll can provide one or both of two things which neither the Daily Pen blog author nor anyone else has so far been able to do to date, despite years of birther trawling to try and find them and despite the blog author claiming to have examples of them…. 1. An example of any person known to have been born outside USA who has a Hawaii birth certificate stating they were born in Hawaii. 2. An example of any person known to have been born ouside USA whose name appeared on any list of births forwarded to Hawaian newspapers by the Health Authorities. Judge Mental: 1. An example of any person known to have been born outside USA who has a Hawaii birth certificate stating they were born in Hawaii. Should be specific to the STATE of Hawaii, otherwise birthers will bring up the Chines guy’s fake BC as proof-positive. 7tgljgf69o7rl: This would explain the out of sequence number of obama’s birth certificate. Obama’s birth certificate number IS NOT out of sequence. Only Sunahara’s is, and she was born in a different hospital than all the rest, which may explain it. Please acknowledge this correction, and, to show you have integrity, kindly state you will refrain from making this claim in the future, as you now know that it is incorrect. Obsolete: Should be specific to the STATE of Hawaii, otherwise birthers will bring up the Chines guy’s fake BC as proof-positive. …….and like last time we’d tell them to take a hike as it should be blatantly obvious that anything before it was state is irrelevant. I deliberately didn’t mention the relevance of 1981 re the revised statute either as so far the birthers haven’t yet even come up with one from after 1981, let alone before.